This week (5th October) sees the launch of our new advertising campaign to further boost our growing community of space-makers – so keep your eyes peeled for our ads across London. 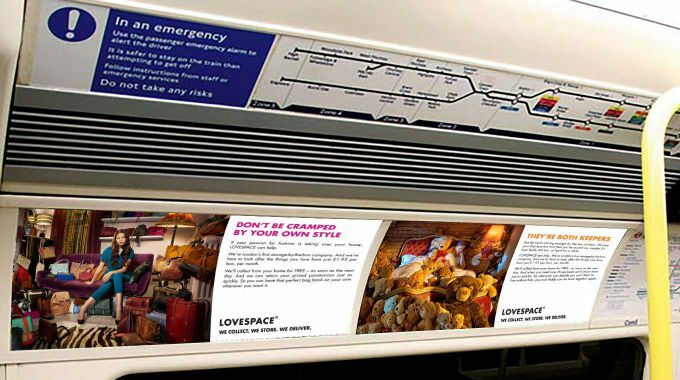 LOVESPACE’s tube-led campaign features two creatives that bring to life a dilemma faced by many Londoners – how to make the most of living in a small home. One looks at a professional woman, feeling ‘cramped by her own style’ and unsure what to do with her growing handbag collection. The second sees a young couple in bed together surrounded by cuddly toys, with the boyfriend clearly disgruntled by the invasion of his space. At LOVESPACE, we realise that the things that you love sometimes just aren’t that useful in your home. In the case of your ever-expanding fashion collection, summer clothing and bags are not particularly useful in the winter. So why take up valuable wardrobe space – or in the case of this campaign, why let them cramp your style at home?! If you need your things back, perhaps for a holiday, just place your order online and they can be back with you again the next day. We also realise that there comes a time in life when the things you love may become a little inappropriate. A box filled with memories from a past flame, or a room filled with the teddy bears from your childhood may not go down so well with your new beau. But if you can’t bear to lose them forever, LOVESPACE will store them safely until you need them back. If you do see the campaign, please let us know over on our Twitter page. LOVESPACE offers storage for just a few £s per month, with free collection from your door! Find out how easy it can be to make space in your home by clicking on the link below.